Is it ‘buyer beware’ or must dealers play fair? As the art world gears up for another round of TEFAF to take place next month in Maastricht, we are faced with the unfortunate outcome involving the sale of two Old Master paintings during last year’s fair. The paintings, sold by the renowned London-based gallery Richard Green, were a river landscape by Jan Brueghel the Elder (below, right) and a winter landscape by Salomon van Ruysdael (further down, left). The Brueghel was sold at TEFAF for €3M, whilst having reportedly been acquired by Richard Green at the German auction house Lempertz in November 2017, for €1.45M (including buyer’s premium). 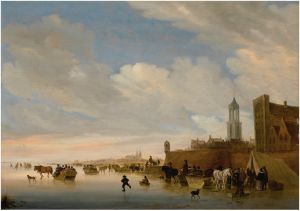 The Ruysdael, meanwhile, was reportedly bought by Richard Green at Sotheby’s New York in June 2017, for $882,500 USD (including buyer’s premium) or €776,600 (using historic exchange rates) and was resold at TEFAF for €2M. The remorse of the buyer, billionaire art collector Gary Klesch, arose when he found out what Richard Green had paid for the works and the significant mark-up of about 100% and 150% on each respective work. Alleging mistake, Klesch is suing Green in London to have the sale rescinded. Klesch claimed that had he been aware of the recent auction sales in the provenance he was given for both works, he would not have agreed to the price paid. Indeed, the provenance provided by Green for both works carefully omitted the fact that they had been acquired by Green at auction, much less revealed the price paid for each. Green, on the other hand, is adamant that this lack of disclosure does not invalidate the sale, having claimed that ‘provenance is a history of ownership, not an auction record’ as reported by the Antiques Trade Gazette on February 14th. There are many facts of interest in this incipient case that raise a few important questions as far as the art market is concerned. Firstly, and most fundamentally, what is to be understood by provenance? Secondly, what are the dealers’ obligations, if any, when it comes to disclosing provenance? Finally, what are the legal consequences, if any, of a deliberate omission in the information provided and are there any potential legal remedies available to the buyer in this situation? What, then, do we understand by provenance, seemingly one of the key elements to be decided by the court in the upcoming trial? It is interesting to note the statement by Richard Green’s Director about provenance being ‘a history of ownership, not an auction record’. In the sense that the auction record relates to the nature of a transaction which transfers title, rather than the transfer of title itself, it is difficult to argue with this on one level. That said, it is not hard to imagine why the failure to disclose an auction sale might well leave a sour taste in the mouth of a disgruntled buyer. The crucial information gleaned through the auction record, as far as the buyer is concerned, is of course the small matter of the price realised in that auction – and hence, in this case, the massive mark-up on the resale. Unquestionably, that information was omitted but it would have been freely available online to any mildly diligent searcher. So should the sale price be understood as part of the provenance, given that the price is in itself immaterial to the change of ownership, which is what provenance is all about? There can, of course, be changes of ownership that do not even involve the question of price (think of gifts or inheritance). Equally, what about the significance of auction records where the work did not, in fact, sell? The fact that no one in the market was prepared to buy a work at whatever asking price suggests that the market does not rate the value of the work very highly. But should this non-sale also be included in provenance information even though the ownership never changed? This brings us to the question of whether a dealer has any legal obligation to disclose these kinds of details, and what the consequences (and potential remedies) might be for a buyer if he does not. As glamourous as art sales can be, especially in the glitzy environment of an art fair such as TEFAF, accompanied by as much free champagne as one can desire, art sales are still, well, sales, regulated in England and Wales by the Sale of Goods Act 1979 (SGA) (or the Consumer Rights Act 2015 (CRA) in respect of consumer-buyers, being persons operating wholly or mainly outside their trade, business, craft or profession). It is important to note that, as far as business sales are concerned, it is not a seller’s duty, under the SGA, to provide any specific information about the subject of the sale to the buyer, which would include any provenance details, nor to justify the asking price. Even for consumer sales, the CRA’s information requirements which oblige a trader to supply certain key details to a consumer would not, in all likelihood, stretch to provenance information, still less, the price history of the object in question. The current suit seems to be grounded in the law of mistake. As such, the likely claim would be that the absence of this information led the buyer to make a mistake that was essential to his consent to the transaction. Whilst it is fairly easy to see the buyer’s argument that should he have known he was overpaying for the works, priced with a mark-up of 100+%, he would not have agreed to the purchase, a claim in mistake is notoriously difficult to establish and a mistake resulting from negligence or lack of proper due diligence by the buyer would be unlikely to receive favourable treatment by the court. Klesch was far from an ignorant buyer. In the unlikely event he could claim no knowledge whatsoever of what a Brueghel and a Ruysdael are worth, he was certainly in a position to use his resources to hire art advisors and other professionals to get him this information in order to be diligent before making his decision to buy the works. Sometimes it’s good, in these contexts, to consider having an ‘art agent’ to advise the buyer and arrange the purchase on the buyer’s behalf (we heard from one such agent at our IAL study forum in July 2018, who made a convincing case for the usefulness of such services). Unfortunately for Klesch, no such agent appears to have been used in this case. In sum, the law does not look favourable for the buyer and indeed in a common law system the imperative of ‘buyer beware’ summed up by the age-old adage caveat emptor would suggest as much. And yet one cannot simply ignore the discomfort, to say the least, generated by the feeling of being taken advantage of that comes, in this case, from the lack of transparency with which the art world has become synonymous. It is this wider issue of lack of transparency in the market on which this case shines a light. That dealers should be able to omit provenance information to make it harder for buyers to discover the price mark-up is, at the very least, probably not the best business strategy when it comes to client retention. In many cases, art dealers can – and do – add value to the objects in their stock, thus justifying mark-ups in price, such as having the work restored, or re-attributed or revealing further information about the importance of the work or a key historic element in its provenance. None of these seems to be the case here, as both works were acquired and resold with the same attribution and, upon inspection of the images in both sale catalogues, there were no obvious signs of restoration having been undertaken. Could the high-profile reputation of the dealer in this case, and the sale at a very prestigious art fair (for which he no doubt had to pay a significant sum) be enough to justify a mark-up of 200+%? And should it be up to the courts to make this ultimate determination? In a legal tradition steeped in the principle of caveat emptor, it will be fascinating to see how the court approaches these questions. 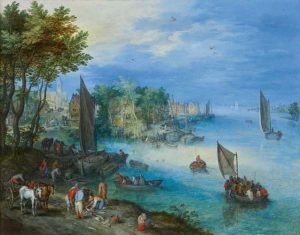 Images: van Ruysdael – http://www.sothebys.com/en/auctions/ecatalogue/2017/master-paintings-n09639/lot.54. This entry was posted in Anti-Money Laundering Act, Art Dealers, Art Fair, Art Market, Art Transactions, Auctions, Dispute resolution, Provenance, United Kingdom and tagged Art Dealers, art transactions, Consumer Rights Act 2015, due diligence, duty of disclosure, ial, institute of art and law, law of mistake, mistake, provenance, Sale of Goods Act 1979, transparency on March 1, 2019 by Julia Rodrigues Casella Hommes. Julia is a part-time researcher for the Institute of Art and Law.